writer, new media artist, curator, independent scholar and physician. Creator of Reconstructing Mayakovsky and Queerskins. This is the ninth in a series on "born digital" literature. The Literary Arts MFA places at Brown were -- before Robert Coover had 'literary hypermedia' or 'electronic writing' added to what was then a Literary Arts (Graduate) Program -- divided by 'genre' -- poetry, fiction, and playwriting. I don't see what we (you and I) do as a 'genre' in that sense, but as a mode of practice. Very recently, I have decided to re-designate our rubric, currently for two MFA places, to 'Digital Language Arts.' Both students and practitioners seem to understand and like this phrase. It's easy to parse and engages directly with contemporary (fine) art practices while retaining 'language' as medium. The relationship to the 'literary' hovers, as perhaps it should, in suspension, requiring examination. In the longer term, as with art in general, I imagine that the question of what is or isn't 'digital' will cease to need highlighting as if it were essential to a particular mode of literary practice. Everyone already uses digital affordances almost all the time, including all 'late print' writers. Cayley makes two important points. First, e-lit blurs the line between fine art (cinema, visual art, net art, sound art) and creative writing. Second, it is not the use of digital technologies that distinguishes e-lit from print writing, it is the "mode of practice." N. Katherine Hayles , Scott Rettberg, and others have written cogently about this. My own take as a practitioner of e-lit is this: being cross-disciplinary, e-lit is not anchored in a single medium, and, accordingly, no single economy exists for its production, distribution and marketing. As such, e-lit has been unable to establish a foothold outside of academia despite the flowering of "digital humanities" programs within universities. Some writers of multimedia literature (Young-Hae Chang Heavy Industries, Yael Kanarek) show in an art-gallery/museum context. Others have work distributed through a new media publisher such as Eastgate, but, in either case, there is arguably zero cross-over of these with print-publishing. Many other artists, who could be categorized as multimedia writers (Tris Vonna-Michell and Alexandre Singh ) do not make work that is specifically "born digital," and so, although their work resonates with e-lit, it is considered "visual" art. The other key point, which I hope these blog posts have made clear, is e-lit is avant-garde. Despite near universal familiarity with electronic writing -- blogging, tweeting, etc, the audience for e-lit is small. For all the talk of "indie," it is not easy to break away from established forms. One has only to look at a film like Peter Greenaway's The Pillow Book (1996) to understand how radical an everyday experience (in this case the use of multiple screens) still appears in the context of a highly codified medium like cinema. For e-lit to be accepted as a legitimate art form, we must stop using print literature as the sole paradigm for judging and experiencing it. What the standard should be is, as yet, unclear. Gallix ends his article with a quote from Mark Amerika which emphasizes the evolving status of e-lit. It is unsurprising then that few established print authors are willing to brave this new world. Paul La Farge , a well-respected author of four novels, whose short stories have appeared in The New Yorker, Harper's, and McSweeney's is an exception. His most recent novel Luminous Airplanes, includes an expansive web-based hypertext. 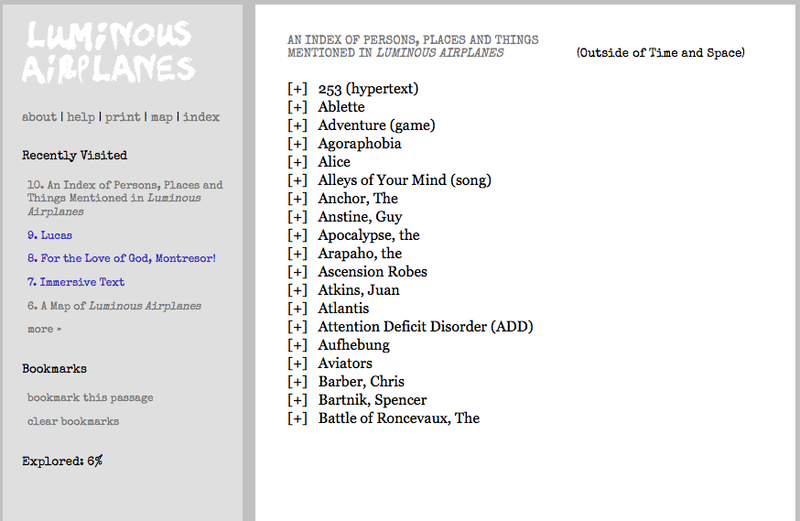 I can't recommend that you read "Luminous Airplanes" online. Navigating the text's hyperlinks disrupts its narrative momentum, to the point that the whole thing feels like a kind of literary 52-card pickup -- i.e., a lot more fun for the thrower than the throwee. The most generous take on this Web project is that it reads like a rough draft of a very good novel -- which this is. I recently had the opportunity to ask Paul some questions about his intrepid foray into e-lit. For those interested in the question of why e-lit remains marginalized, Paul's answers are particularly revealing. Why did you decide to create the online hypertext of Luminous Airplanes? Did you write the novel first and then decide to add this later? How did it evolve? Were you familiar with the "born digital" lit that was out there? Luminous Airplanes began as an online project. I started writing it in the spring of 2000, and spent a couple of years experimenting with various stories and technologies which went almost nowhere. In 2003 I wrote a draft of what would become the novel, and thought I had given up on the online idea, but the idea was curiously hard to give up. I wrestled with the novel for a few more years (I work slowly), then I realized there could be a print book which tells a more or less linear story, and a hypertext (or "immersive text," which is what we're calling it), which contains all the branches and reconsiderations and so on that the book's linear form didn't accommodate. I suppose my thinking could have stopped there, but it didn't. In the spring of 2011, I finally had my technological act together, and I began to populate the web site with all the text I had written for it; at that point it became clear that the immersive text is the project's primary form. Which is to say that Luminous Airplanes has become what I wanted it to be in the beginning, but it took a long time to get there. When I started writing Luminous Airplanes, the Infocom text-adventure games (Zork, etc.) were the only works of digital literature I knew, and they had a fairly large influence on the project. I educated myself about digital lit as I was working, but for the most part I was unimpressed by the literary hypertexts of the 1990s and early 2000s. They were visually awkward, difficult to navigate, and (with exceptions) not compelling from a narrative point of view. The most useful models I found for non-linear fiction were print books: Tristram Shandy, Nabokov's Pale Fire, Jacques Roubaud's The Great Fire of London. Was there a reason you chose hypertext as the form for Luminous Airplanes? Yes, several reasons. The narrator of Luminous Airplanes suffers from attention-deficit disorder, and the branching form of the immersive text seemed like the best way to represent the convolutions of his thought. Also, much of the story concerns San Francisco in the 1990s, and the form (not to mention the look of the Luminous Airplanes site) is an homage to that era. It's funny: hypertext is hyped as a forward-looking form, but one of the reasons it's most apt for this project is because it looks backward, to a 90s-era optimism about the Future of Literature. What has the online version allowed you to do with character, plot, etc. that the print novel didn't/couldn't? See above, I guess: the immersive text is good at representing certain states of mind. But then beyond that I'm enjoying the immersive text's ability to keep multiple stories going without telling you which one is the most important, or which one you need to read first. It creates a lot of openness for the reader to explore and make her own discoveries, and to reach her own conclusions. What do you think text can do for storytelling that other forms of media (image, sound) can't do? Well, one thing text seems good at is representing interiority. Images are great at representing space and action, but less good at communicating the experience of being inside someone's head. Sound might be better at this than images--there's this whole idea of the interior monologue -- but for what I'm doing, describing huge swaths of a person's interiority, sound is too slow. Text is closer to the speed of thought. Was your publisher supportive? Resistant? Clueless? Any thoughts as to how the publishing industry is going to deal with born digital writing? Even The Silent History with all those McSweeney's connections was really self-published. Farrar Straus & Giroux was amazingly supportive of the Luminous Airplanes immersive text, albeit mostly as a marketing tool to sell copies of the book. My paperback publisher, Picador, has also been very supportive, and mostly for the same reason. I'm sure the day will come when big publishers like FSG and Picador publish digital work; from what little I understand of the industry, I suspect that the change will happen first in children's books, and that it will filter up into adult lit, maybe as the children themselves filter into adulthood. What has the response been from other writers? From readers? The response to Luminous Airplanes has been good. Not surprisingly, many of the people who have taken the time to tell me they like the hypertext have been on the younger side: college students, or people around that age. But this is not universally true. I had an excellent conversation with a book group in Boston last spring. This was mostly people in their late 50s or 60s, so I assumed they would all have read the book, but I was wrong: about half of them had read Luminous Airplanes as a hypertext. You and I have talked about how digital writing needs a new poetics to describe it. Do you think that is available now? I think that film language may be the place to start -- any thoughts on this? Who is competent to review this kind of work? Illya, this is an excellent question. I actually don't think digital literature is suffering from a lack of theory at this point; if anything, it suffers from a lack of practice. We need more writers! And a more diverse and robust way of getting their work into the world: not just more competent critics (we have some), but more kinds of competent critics, and more places where conversations about digital literature can happen, and more avenues by which digital lit can reach readers. All of this will surely happen in time. What I think the medium needs now is encouragement, and perhaps rescue from the forbiddingly technical language in which it has been theorized. It depresses me to think of digital literature as being exclusively an academic specialty: it's as if Film Studies departments had sprung into existence all over the world, before anyone had made any movies. Mark your calendars! Join me, Paul La Farge, Mark Amerika, Ian Hatcher, and Yael Kanarek for an evening of "born-digital" reading and performance at the Kitchen, Monday March 25 at 7 p.m.. The event is free.